Imagine a world without plastics. The computer on your desktop, the TV on your wall and the credit card in your wallet would not exist. The car you drive would weigh more and have worse mileage, and though your smartphone may have an exterior made of glass and metal, plastics make up the lion’s share of the interior. Yet important as these consumer goods have seemingly become in our tech-crazed lives, there is one area where plastics are truly critical: in medical devices. Humans have used medical devices for thousands of years. Metal was the principal material for the first long stretch of history as it served a wide range of purposes, including surgical instrument, dental implants and steel plates. 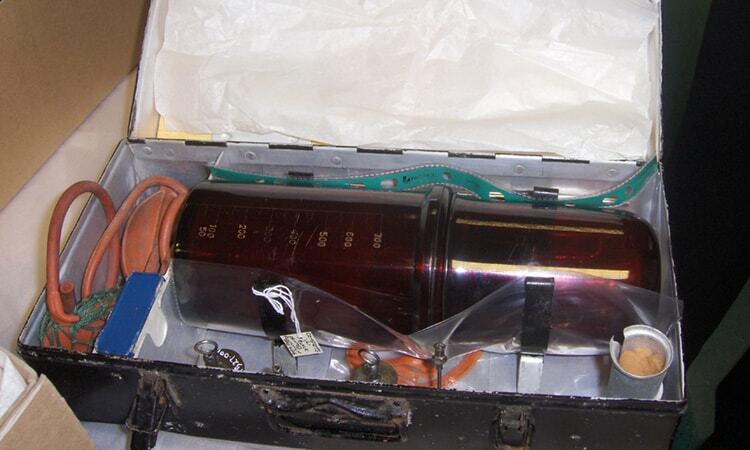 In the beginning of the 20th century, growing demand for health care and in turn more sophisticated devices led to the discovery of new materials. Strong and heat-resistant, ceramics has primarily found use in orthopedics and dental and bone implants after being introduced in the 1930s. Closely related, glass has mainly been used for bone replacement, storage, vials and tubing. Yet the push toward better health care technology did not end there. Scientists began experimenting with plastics in the late 18th century, but it wasn’t until the production techniques were refined by the middle of the 20th century that the material took hold and in effect revolutionised healthcare. 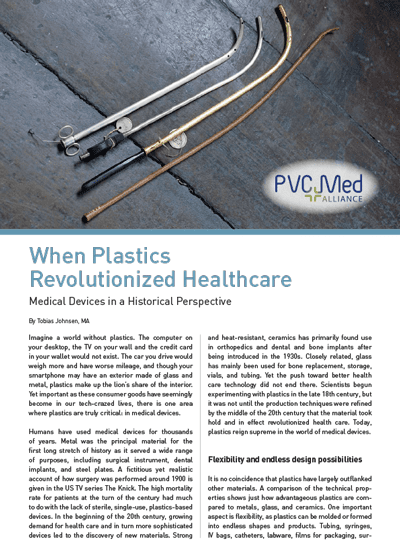 Today, plastics reign supreme in the world of medical devices. was state-of-the-art in the 1940s. yacht “Grille” in case of emergency. urethra and could scour the mucosa. In today’s high-tech hospitals, PVC is everywhere. It is no coincidence that plastics have largely outflanked other materials. A comparison of the technical properties shows just how advantageous plastics are compared to metals, glass and ceramics. One important aspect is flexibility, as plastics can be molded or formed into endless shapes and products. Tubing, syringes, IV bags, catheters, labware, films for packaging, surgical instruments, housings and connectors are just a few examples of the wide array of plastics-based medical devices. In contrast, metal, ceramics and glass are strong materials but inherently inflexible, which limits their usage remarkably. A second aspect is resistance to chemicals and lipids. While glass and ceramics surpass plastics in this regard, their brittleness and inflexibility weigh down. And metals are no competitor, since they can be attacked by acids and alkalies and tend to corrode over time. Depending on the production technique and the type of polymer used, plastic-based devices are able to withstand lipids, bases, alcohols and other forms of chemicals. This makes for stable products that heighten patient safety. Perhaps the most important factor in the shift towards plastics-based devices is the ever-growing need for sterile, disposable devices. Historically, one of the most formidable challenges in healthcare has been to keep diseases from spreading. 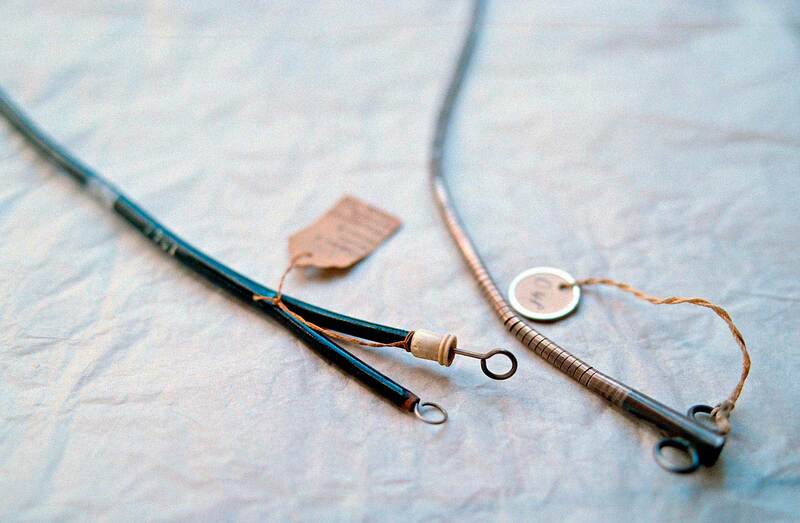 Prior to the middle of the 20th century, medical devices were intended for multi-use, whether made of glass, ceramics or metals. 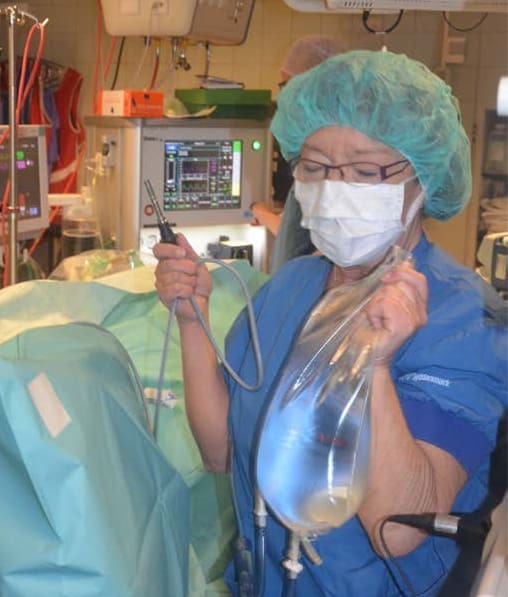 With the introduction of single-use, plastic-based devices at a large scale in the 1960s, it was suddenly possible to eliminate most of the dangerous cross-contamination between patients and also make hospitals safer environments for those working there. In later years, the main drivers behind the turn to plastics have been an increase in infectious diseases around the world, growing demand for proper health care in BRIC countries, aging populations leading to a rise in geriatric care and a shift towards shorter hospital stays and more home health care. This is coupled with changes in sterilization technology. While metals, ceramics and glass are well-suited to the traditional sterilisation methods – ethylene oxide, steam and autoclaving – plastics are more compatible to new sterilisation technologies such as gamma radiation. Thus, plastics-based devices are easily sealed, sterilised and disposed – and ready to use in all situations. Though a tragic example, the recent Ebola outbreak in West Africa confirmed just how critical sterile, disposable devices are. And not to be dismissed, plastic-based devices can be mass-produced at low cost and are thereby very economical. Also, the material’s lower weight compared to metals, glass and ceramics keeps transportation costs and cost of part per unit weight down. Considering the projected demand for healthcare worldwide, affordability is a principal factor in most countries. Polyvinyl chloride, or PVC, is the most widely used plastics, and material in general, for medical devices, with a share of about 40 %. Patented in 1913, PVC was introduced during World War II to replace glass and metal for packaging of pharmaceutical products. After a modest start, the material became increasingly popular in the postwar years, and today it has no equal in the world of medical devices. PVC owes its success to a number of factors. Its versatility allows for the manufacturing of a wide range of products, from rigid containers to flexible sheeting. Because of its transparency and unsurpassed anti-kinking properties, PVC has become a primary choice for tubing. Other applications include containers for IV and dialysis fluids, blood bags, dialysis bags, IV sets, and examination and surgical gloves. Add to that ease of fabrication, chemical stability, biocompability and cost effectiveness. In sum, PVC has proven an unbeatable combination of superb technical properties at a low price, and there are currently no better alternatives available when it comes to medical devices. On top of that, PVC is increasingly used for other purposes in hospitals. Due to its technical properties, the material makes for hygienic and chemically resistant wall covering. Another example is durable, shock-absorbent and safe flooring that is noise reductive and comfortable to walk on, and which allows for integration of signage of various kinds for easy navigation. And in combination with stretch ceilings of the same material, PVC flooring can even improve acoustics and thereby help make the hospital a more pleasant place for patients and staff alike. Sastri, V. R. (2010). Plastics in Medical Devices: Properties, Requirements and Applications. Elsevier. Blass, C. R. (1999). Polymers in Disposable Medical Devices: A European Perspective. iSmithers Rapra Publishing. Blass, C. R. (2001). The Role of Poly(Vinyl Chloride) in Healthcare. iSmithers Rapra Publishing. Zhao, X. and J.M. Courtney (2009). Update on Medical Plasticised PVC, iSmithers Rapra Publishing.